HDFC Bank has launched IRA 2.0, its interactive humanoid at the Koramangala Branch in Bangalore. The advanced version is aimed to enhance user experience for customers visiting in this branch. 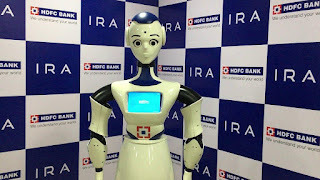 HDFC Bank has developed IRA (Interactive Robotic Assistant) 2.0 in collaboration with its technology partners Invento Makerspaces and Senseforth Technologies. It became the first bank in India to introduce a humanoid IRA 1.0 for customer service at the Kamala Mills Branch in Mumbai last January. Currently, IRA 1.0 is stationed at the Palarivattom Branch in Kochi. IRA 2.0 is more advance than the first one (IRA 1.0) and it’s a blend of IRA 1.0 and EVA with some added features. It will interact with the customers visiting the bank, answer bank-related queries, frequently asked questions (FAQs), and also guide them inside the branch with voice-based navigation. It has an in-built GPS as well as a speech recognition module that can be trained to understand what customers speak. It uses ultrasonic sensor to move in inside the branch as well as a face detection algorithm for recognition the customers. The bank has also launched its virtual assistant ‘EVA’ on Amazon Alexa and Google Assistant. HDFC has become the first bank to offer voice banking experience on Alexa. EVA on Alexa will support banking transactions and deliver hyper-personalized services using voice. HDFC Bank customers can now chat with EVA using voice from the comfort of their homes, without having to pick up a phone, tablet or laptop. Customers can also inquire about how to block/unblock card, what to do if one forgets pin, and updating personal information.